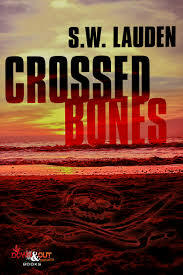 Just finished Crossed Bones by S.W. Lauden and I am ashamed this great piece of writing slipped past me for so long. This is a continuation of the Tommy and Shayna adventures we last read about in Crosswise. Shayna is your classic femme fatale and she has Tommy caught in her web. While it takes a little bit of time for the characters to intersect in this book, we certainly see the mark Shayna has left on Tommy’s soul from the beginning of the book. Tommy knows he is in danger when he interacts with her, but like any addict, he finds it impossible not to fall for his vice. When Shayna needs Tommy the most, he shows up willing to do battle with a local drug lord, The Mayor, and do Shayna’s bidding. With pirates and a pirate map leading to a possible goldmine, Tommy and Shayna find themselves neck deep in trouble, violence, love, and lust for each other. This was a great read that reminded me how much I have loved everything Lauden has written. One of the strengths of this novel is in the manner Lauden introduces the most unexpected events and keeps you guessing what is coming next. His dialogue, and the manner in which he turns a relatively hard-to-believe plot into a dangerous foray into the violent side of treasure hunting. Lauden now has 2 must-read series on his hands; the Greg Salem series and the Tommy and Shayna Crime Capers. Which one should a reader grab first is a decision akin to do you eat the Filet Mignon or the lobster tail of the Surf and Turf? Either way your appetite is satiated and you know you’ll be back for more at a later date. Lauden is more than a writer to watch; he is a must-read author who can turn any genre on its ear.